In collaboration with Kenya’s Office of the Great Lakes Region within the Ministry of Foreign Affairs and International Trade, the Auschwitz Institute for Peace and Reconciliation (AIPR) organized a regional training seminar entitled “Early Warning and Early Response for the Prevention of Mass Atrocities” with the support of the German Federal Foreign Office. 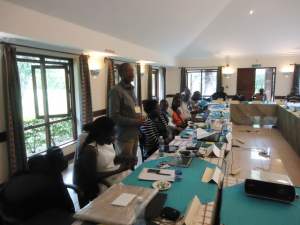 The weeklong seminar beginning on December 14, 2016 in Naivasha, Kenya involved the participation of more than 30 attendees who represented a diverse collection of governmental, academic, and civil society organizations throughout Kenya and the Great Lakes region. Following the event’s welcoming remarks, the opening day of the program was comprised of an introduction to the state of Kenya’s early warning and early response system, given by Mr. Peter Mwamachi of the country’s National Steering Committee on Peace Building and Conflict Management (NSCPBCM). Mr. Mwamachi was followed by a module on community resilience training that focused on effective approaches and lessons learned, led by Ms. Millicent Otieno from Local Capacities for Peace International. The day was concluded with a segment led by Mr. Lawrence Orowe of the Kenyan National Committee for Genocide Prevention and AIPR Africa Programs Director Dr. Ashad Sentongo that encouraged participants to develop projects oriented towards mass atrocity prevention for potential implementation in Kenya. The training seminar’s second day began with an overview of the previous day’s contents and a module entitled “Risk Knowledge”, which was presented by Ms. Bonita Ayuko. This was followed by modules on the development of community-based response capabilities by Mr. Dominic Ruto of Act Change Transform, a Kenyan NGO, and on effective capacity building related to grassroots structures for peace, led by Mr. Elly Maloba of NSCPBCM, as well as a return to the project planning group exercise which began the previous day. The third day of the seminar opened with a module on communication and the dissemination of information for early warning and early response which was led by Mr. Dismas Nkunda, current Chair of the Uganda National Committee for the Prevention and Punishment of the Crime of Genocide, War Crimes, Crimes Against Humanity and All Forms of Discrimination. Following this, Mr. Elly Maloba returned to give a presentation on lessons learned during the design and implementation of a “people-centered” grassroots early warning system focused on community resilience. The day was concluded with a presentation on Tanzania’s Center for Early Warning from the perspective of the Tanzanian National Committee, led by the Reverend Canon Thomas Godda and additional time for the project planning group work. The following day featured a module on experiences from the East African Community (EAC) related to regional coordination for early warning and early response, led by Mr. Benoit Bihamiriza of the EAC. This was followed by a module on early warning and the prevention of sexual and gender-based violence by Mr. Nathan Byamukama of the International Conference of the Great Lakes Region (ICGLR) and a module focusing on the necessary roles and important challenges involved in the prevention of genocide and mass atrocities from a gender perspective by Ms. Lina Zedriga of the Uganda National Committee for the Prevention of Genocide. The working day ended with a final module devoted to the development of the project planning group exercise that began on the opening day. The final day of the training seminar was followed by a formal meeting of Kenya’s National Committee, during which they discussed their Strategic Plan and 2017-18 Work plan as well as other related projects. Overall, the regional training seminar served as an opportunity for members of the Kenyan National Committee and the Uwiano Platform for Peace to come together with regional governmental and civil society participants for a weeklong program dedicated specifically to early warning and early response. Demonstrating an understanding that, for early warning and response systems to be successful, they must be “people-centered”, many of the training seminar’s modules covered strategic considerations of this nature. 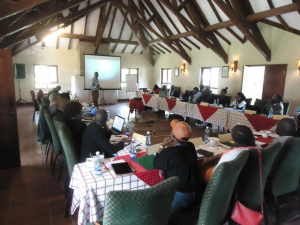 The program’s emphasis on early warning and early response also reflected the topic’s especially high priority to Kenyan government and civil society representatives, as the country works to prepare preventive measures to ensure that the upcoming August 2017 national elections are free, fair, and peaceful.